Ashley Hutchings, a man who had frequently played the UFO club at the hight of the swinging 60’s,a man who had jammed with Hendrix and had rubbed shoulders with Pink Floyd was becoming more and more fixated with an increasingly narrow genre of music. In Fairport and even Steeleye he was willing to at least tolerate a liberal tradition of folk music ie folk music of Britain and Ireland but from 1972 onwards all he was really interested in was English folk music. As a Bass player he would have to make some allowances or learn another instrument so his subsequent recordings still contained trace elements of the 60’s beatnik. In 1972 he teamed up with other Fairport stalwarts drummer Dave Mattacks and genius guitarist Richard Thompson to record some of that most English of music Morris Tunes. In order to make those tunes actually happen he teamed up with fiddler/singer Barry Dransfield and player of all things squeezebox John Kirkpatrick. At a time when his peers were dropping acid and listening to The Crazy World of Arthur Brown Kirkpatrick was practising his Button Accordion, no doubt he could play tunes like ‘Shepheard Hey’ or ‘The Nutting Girl’ in his sleep. 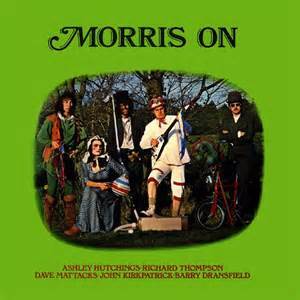 The resulting album Morris On failed to set the world on fire, there was probably a limited market at the time for rocked up morris tunes but its status has grown over time. Despite the calibre of the players involved its a primitive album by today folk rock standards and is all the better for it, Kirkpatrick and Dransfield play their standard tunes and the rock guys rock them up, job done. One of the tracks on Morris On is ‘Cuckoos Nest’ which is both a ‘bawdy’ song and a nice hornpipe. But the song had power outside of the folk clubs, I refer of course to the four young men who shook the world. Ladies and gentlemen…. At Thorpe Grammar School it was all change by the third year. The previous two years has been spent assessing our academic ability. I had previously been allocated, probably on the basis of having arrived from Germany, to an exceptionally stupid class. As a consequence I emerged as some sort of child genius and was due to move to the ‘Latin’ set. Yes my school actually taught Latin and employed a mad cultural supremacist who commuted for Cambridge every day to run it. The Latin set was for the elite which is as far as I was concerned didn’t look a lot of fun. I did however have an ace up my sleeve, the next set down was the ‘German’ set so called because they spoke; well you get the picture. With a bit of fast talking I persuaded the authorities that this was the class for me as I already spoke German so should be able to thrive academically, this class was made for me (German was in fact the only O level I failed). So come the new term I was in the ‘German’ set under the lovely and amiable ‘Frau’ Moore instead of crazy Nazi bloke and my life began to change. The main point of school of course is to make friends and have a laugh and I achieved both.Firstly there was Phil who remained my firm friend through school and beyond. I think I knew Phil before third year from the ‘hanging about on bikes’ crowd but my other new friends were just that, new friends, notably Chris Williams and Duncan ‘Dunc’.Chris was not so much approaching puberty as crashing through it at the speed of light. As well as serious acne he had a lot of energy which sometimes manifested itself in random violence. He was also a bit of a musician who played violin and actaully appeared to have an amiable relationship with Mr H who was still a frightening presence in my life. My guitar playing was developing as fast as possible given the total lack of guidance I received. These days there are online lessons, peer forums and an unlimited access to written material. There’s also no lack of teachers who can teach you things you actually want to play. Non of these existed when I was learning, there was a couple of classical guitar teachers and the odd tutor book which was at least 20 years out of date. My playing took a leap forward when I obtained the famous Beatles Songbook (though mail order) which meant a learned a lot of chord sequences simply because I wanted to play the songs sooo bad. Phil picked up the guitar after I did but he had a great advantage, his sister also played and under her tuition he got off to a flying start. His approach was different to mine though, as I had very little to play I played everything I had be it a folk song or a show tune and I practised till I got it right. Phil on the other hand only played what he liked and if what he liked was too difficult he played his own version of it. As a consequence he soon sounded a far better player than me. Chris also had an older brother who was heavily into all things folkie and had a few useful resources for us. Firstly there was a tenor banjo then there was a Ewan MacColl songbook and at least one Dubliner’s LP. With these scant resources Chris and me started playing together now and again mainly using the Ewan MacColl songbook as our source material. MacColl, of course was a hard line traditional artist who’s left-wing purist folk ideals had dominated the scene for a decade, all this passed us by of course, we had words, tunes and chords, soon we would have songs. In my heart of hearts I really wanted to do something that rocked a bit more but Chris had the energy and the banjo so I was happy to go along with it at this point. Recruiting Phil was a no brainer , he was the best guitarist we knew( well the only guitarist actually). Getting Duncan in the band was more of a mystery, he joined as vocalist. I couldnt really say he couldnt sing but I dont remember that he could either. He lacked the singer’s ego and would only usually sing if prompted by someone else singing along. This role fell to Chris who could do an acceptable folky voice thanks to his puberty battle. Our first and possibly only gig was in front of our class. We had a repertoire of working man’s songs from Ewan, I remember material about a mining explosion and herring fishing. We must have done a few numbers because I remember playing guitar, banjo (cunningly in guitar tuning), my Grandad’s harmonica and whistle. Best of all of course we had a song which was a paean to a ladies front bottom. Well, of course, it all went well but we weren’t asked back. Already we were having artistic differences, Phil liked the blues and not much else so eventually he left and was replaced by a girl in our class called Pam. Pam was notable for being very tall,by 70’s standards at least. She played trumpet which is, to say the least, under-represent in traditional folk. At one point I remember us doing ‘When the Saints’ with Chris playing proper banjo in a violent fashion and me hitting a guitar case. We played a couple of sets in youth clubs but even in those entertainment starved days our days were numbered. By the time I was as tall as Pam the band had split. Over a decade later the Pogues emerged with a souped up repertoire of Dubliner’s songs and the definitive version of MacColl’s ‘Dirty Old Town’.They are still touring while Cuckoo’s Nest remains a distant memory for at least five people. If only we’d have come out of Camden Town with some better playing, a charismatic front man and some unique original material. Fame can be a fickle mistress. This entry was posted in rock music and tagged 1970's, 70's biography, banjo, Britain, East Anglia, folk rock, gigs, guitars, Morris On, Thorpe grammar school. Bookmark the permalink.